The holiday season is finally upon us. For the most part, that means family, friends, food, and fun! 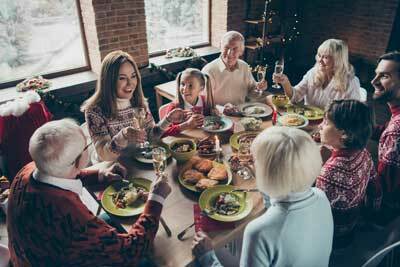 But, because the holidays weigh heavily on so many minds, they can also come with a variety of different emotional challenges. It isn’t always easy to be in forced family situations. Some people experience social anxiety. Others get overly stressed about gift-giving or financial burdens. No matter what your emotional challenges are during the holidays, you shouldn’t feel hopeless. There are things you can do to manage these emotional challenges. Once you put these tips to good use, you can get through this time of year with a bit more comfort and a lot less stress. Only you truly know how you feel at any given time. Rather than pushing uncomfortable feelings down or ignoring them, acknowledge them. It can make a big difference. When you acknowledge feelings—especially negative ones—you become more aware of what your triggers are. If you start to feel anxious at a holiday party, acknowledge those feelings and step outside for a moment, rather than trying to fight through them. Being able to recognize what your feelings really mean can make it easier to manage them throughout the whole season. Emotions can get the best of us during the holidays because our expectations tend to run high. We want the perfect decorations, the perfect meal, the perfect family scene. Unfortunately, things rarely work out exactly as planned. It’s important for you to be okay with that. Be more realistic with your expectations. Furthermore, be adaptable to things that might change or that won’t go your way. When you can adapt to each situation, you’ll have a better time managing emotions like sadness or anger. Chances are, you’re going to have to see family members over the holidays. If you have issues with any family members, this can create a lot of anxiety. But, what better time of year to set aside your differences? You don’t have to agree with your family on everything. But, those differences don’t have to keep you apart or make you feel overly-stressed. If you know you’ll be seeing a certain problematic family member, try to mentally prepare yourself. Tell yourself you won’t let those differences get in the way of having a good time. In fact, you can even strategize a game plan to avoid certain hot topics. Between shopping, baking, parties, and more, holiday schedules can feel like a blur. Mostly, that’s because most people don’t actually sit down and create a specific schedule. As a result, it’s easy to feel stressed and overwhelmed. Plan ahead as much as you can. Write out a detailed schedule and try to stick to it. It should include things like shopping days, cooking days, etc. Even the more mundane chores should be on your schedule so they don’t sneak up on you. When you plan ahead and know what you have coming up, you’ll be far less likely to feel stressed about your holiday happenings. It’s easy to get caught up in the hustle and bustle of the season. Unfortunately, that often means people spend less time on self-care. If you find yourself getting overwhelmed or anxious during the holidays, it could be because you’re not taking care of yourself. Don’t abandon your healthy habits just because of the holiday season. Stick to a regular exercise regimen, eat well, and try to find 10-15 minutes for yourself each day. Use this time to breathe, relax, or even meditate. Even a short amount of time can allow you to feel far less stressed. Putting up with a bit of holiday stress is normal. But, when emotional challenges arise this time of year, it’s important to know how to combat them. Once you’re able to do that, you’ll have a much easier time enjoying everything the season has to offer! If holiday stress or seasonal anxiety has you feeling overwhelmed, please contact me. I would like to help you enjoy not only the holidays but every day.